For the past three years, Greenpeace Brazil has been collecting signatures in support of a bill that would establish zero deforestation as the law of the land. Last Wednesday, accompanied by a crew of religious leaders, celebrities, senators and other supporters of a ban on the felling of Brazil’s forests, the activist group formally presented the draft legislation to the Brazilian Congress — signed by 1.4 million Brazilians. “We submit this bill to Congress and now it’s time for them to reflect on the will of the people,” Greenpeace’s Cristiane Mazzetti said in a statement. The annual rate of Amazon forest loss in Brazil has slowed by 75 percent since the early 2000s, but roughly 5,000 square kilometers (1.2 million acres) of rainforest is still destroyed every year. Greenpeace says that’s the equivalent of 700,000 soccer fields — and even some lawmakers joined the group in saying that it’s time for the country to make it official policy that economic development not be done at the expense of the Amazon. A recent analysis by Paulo Moutinho of the Amazon Environmental Research Institute and Steve Schwartzman of the Environmental Defense Fund supports Greenpeace’s assertion that zero deforestation is entirely possible for Brazil to achieve without foregoing economic growth. Brazilian President Dilma Rousseff has pledged to eliminate illegal deforestation and restore 12 million hectares (about 30 million acres) of forest by 2030 as part of broader efforts to combat climate change, itself a major threat to the wellbeing of tropical rainforests the world over. But zero illegal deforestation by 2030 is a “considerably less ambitious goal” than many Brazilian states have already proposed for themselves, Moutinho and Schwarzman say. Pará, for example, a major agricultural state, has adopted a target of 80 percent deforestation reduction by 2020 and zero net deforestation thereafter. And Acre state, which still retains nearly 90 percent of its original forest cover, “is already implementing the most ambitious and successful system of payment for environmental services in the tropical world focusing on forest conservation,” Moutinho and Schwarzman write. Greenpeace and other forest advocates, like Bishop Guilherme Antônio Werlang, want Brazil’s federal government to take those ambitious efforts as examples and commit to swifter action to end deforestation of the Amazon altogether. 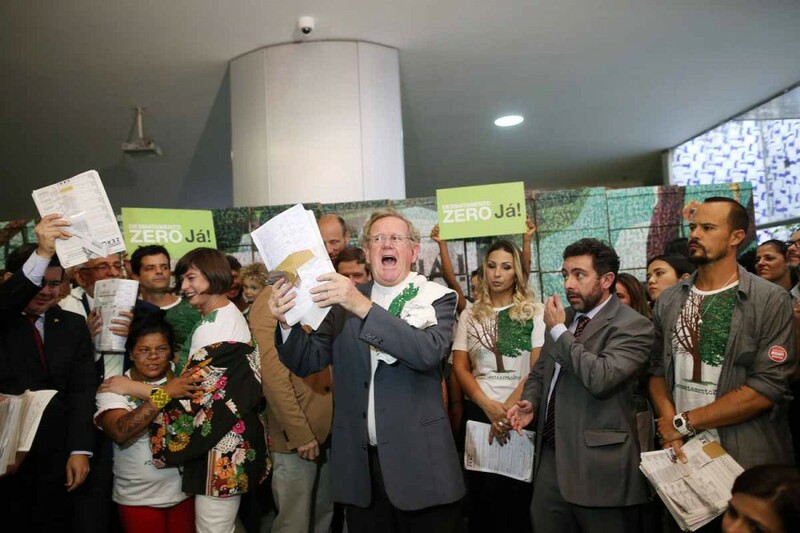 Congressman Jose Sarney Filho, president of the Parliamentary Front Environmentalist, receives 1.4 million signed petitions in support of the Zero Deforestation bill. October 7, 2015, Brasília – DF. © Adriano Machado / Greenpeace. Bishop Guilherme Antonio Werlang recalled that Pope Francis recommended the defense of forests in his papal encyclical. October 7, 2015, Brasília – DF. © Adriano Machado / Greenpeace. To represent the more than 1.4 million people who signed in favor of the project, activists set up a wall, with boxes containing signatures, formed with about 6000 photos of those who participated in the movement. October 7, 2015, Brasília – DF. © Adriano Machado / Greenpeace.